PLEASE NOTE THAT THE SKATING RINKS AND SLIDING HILL ARE CLOSED FOR THE SEASON. WE HOPE THAT YOU ENJOYED THEM! Come enjoy beautiful winter days with your family and friends! It’s all free of charge. Open from December 15th 2018 to March 15th 2019. Click on the button below for the sliding hill and the skating rink conditions; variable schedule depending on weather conditions. This natural slope is the perfect sliding hill. One skating rink is for hockey and the other for leisure skating. There is a chalet where you can lace up your skates and warm up. 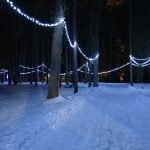 A 1 km long skating trail that is lit in the evening. There is a chalet where you can lace up your skates and warm up. Departure from the municipal beach (3304 8th Avenue) that takes you across the lake – depending on weather conditions, or from the Rawdon Golf Club (3999 Lakeshore Drive). *Snowshoe rental available at the municipal beach. There is a fee for non-residents.